What attract the attention of users on a digital page? The difference between Covert and Overt attention. Visual Attention is used to select important areas of our visual field (alerting) and to search a target in cluttered scenes (searching). Covert Visual Attention: without eye movements (covert fixations aren’t observable). It is important to keep in mind that attention is also able to shift covertly to objects, locations, or even thoughts while the eyes remain fixated. Changes in spatial attention can occur with the eyes moving, overtly, or with the eyes remaining fixated, covertly (Wright & Ward, 2008). Prior to an overt eye movement, where the eyes move to a target location, covert attention shifts to this location. For example, when a person is driving and keeping their eyes on the road, but then, even though their eyes don’t move, their attention shifts from the road to thinking about what they need to get at the grocery store. The eyes may remain focused on the previous object attended to, yet attention has shifted. Covert Visual Attention is relative to characteristics of graphical components in the screen independently of the tasks, where Overt Visual Attention data depends to the task that people want to realize on a site. These two data are complementary. 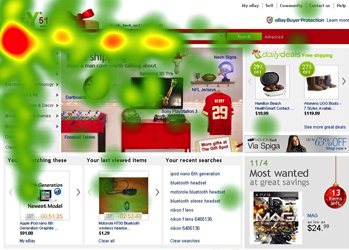 Software Service like Gweezy modelize Covert Visual Attention where Eyetracking gather Overt Visual data. Does Gweezy use the same predictive technologies/algorithms (??) 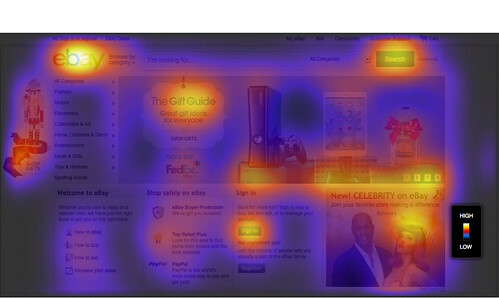 of other systems I’ve seen that product visual attention heatmaps based on mouse movement? Or is it completely different?